is the Little Susitna River located just one and a half hours from the city of Anchorage. You will find wildlife such as moose crossing the river, an eagle flying above, waterfowl splashing harmlessly and maybe a curious bear overlooking the situation, you're guaranteed to have a wonderful trip. The opportunity for a once and a lifetime experience is almost guaranteed. Besides hooking the salmon of a lifetime, a 6 or 10-hour trip with all the essentials supplied is above and beyond the expectation of any avid fisherman. The calm meandering river is a relaxing and fun way to spend your vacation time. With over 60 miles of fishable water from its mouth to the Parks Highway, the Little Su offers less populated holes and more fishing fun than some of the more well-known Alaskan rivers. It is located about 30 miles from the city of Wasilla. 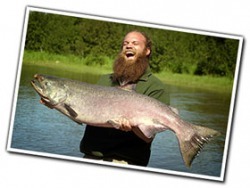 It is the closest guided fishing you can find from Anchorage. This slow-moving and shallow river flows about 3 mph and can be walked across at most parts. Valley River Charters has custom made jet boats that are made to cruise these shallows and offer a quick trip to the very best fishing holes. Fishing on this river runs from May through August and sees all five species of salmon and rainbow trout.